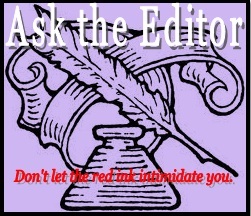 Every 1st and 3rd Thursday, I'll take your editorial questions. Grammar, spelling, punctuation, sentence structure and more! I will showcase questions and answers (with permission) once I get questions as well. To ask a question, please fill out the form below. I've been a freelance editor since November 2010. If I don't know the answer, I will find it.